2001 June 15 (USA), June 21 (Australia): The movie `Tomb Raider' opens, based on the video game of the same name, and starring Angelina Jolie as the heroine Lara Croft. This particular Defender is a long wheel base, high capacity pickup (HCPU) fitted out with roll cage, roof rack, spot-lights, winch, sand ladders, bonnet (hood) mounted spare wheel, and wing mounted axe and shovel. 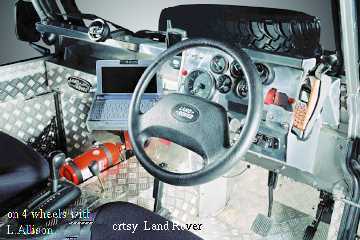 Inside the hose-out, checker plated interior, is a fine set of instrumentation including a navigation screen. Note just the two pedals, and the automatic shift. The `Bonatti grey' vehicle was fitted out by Land Rover's special vehicles operation (SVO) "in conjunction with Paramount Pictures." It was shown at the Geneva Motor Show earlier this year. Just in case you are not familiar with the video game, the original Lara Croft is a computer generated female Indiana Jones of improbable proportions who is in and out of action and trouble. 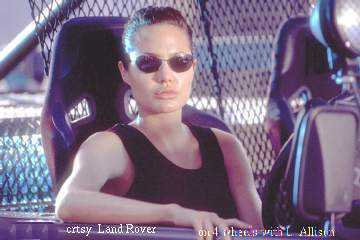 Other Land Rover products appear in the movie: Powell, the baddy, drives a Range Rover (that's vehicular type casting); his henchmen drive Discovery IIs. Even the Freelander gets a run -- Lloyd Allison, 2001. 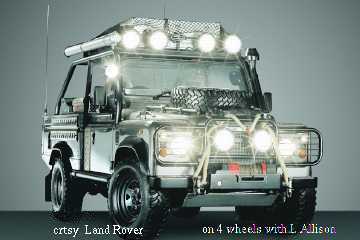 "Land Rover will be launching two ranges of Lara Croft Tomb Raider Defenders to markets worldwide [in 2001]. In Australia [it] will offer a limited edition Defender V Wagon Extreme in Bonatti Grey." Tomb Raider: Paramount Pictures and Lawrence Gordon, in association with Mutual Film Company, a Golar/Eidos plc Production. Producer: Lawrence Gordon. Director: Simon West. Screenplay Patrick Massett, John Zinman and Simon West. Based on the Eidos Interactive game, developed by Core Design. Starring: Angelina Jolie (Lara Croft), Daniel Craig (Alex Marrs), Jon Voight (Lord Croft), Leslie Phillips (Wilson), Mark Collie (Larson), Rachel Appleton (young Lara), Noah Taylor (Bryce), Iain Glen (Manfred Powell), Christopher Barrie (Hilary, the butler).